VIRGINIA BEACH, VA. (April 26, 2017) – Food and dining are becoming a more central part of many travelers’ vacation experiences. In fact, AAA’s latest travel survey found that an estimated 22 million Americans expect to take a culinary-focused vacation in the next 12 months. 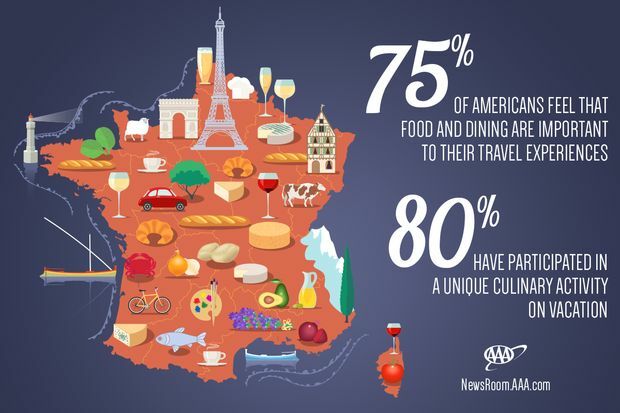 Seventy-five percent of Americans feel that food and dining are an important part of their travel experiences and four in five say they have engaged in such unique activities as touring wineries and distilleries, eating with local families and engaging in hands-on experiences such as cooking classes led by local chefs while traveling.